Thanks for the Overwhelming response for this event. Pre-Sale ticket sales has ended, but you can still purchase tickets at the door with price of $30. 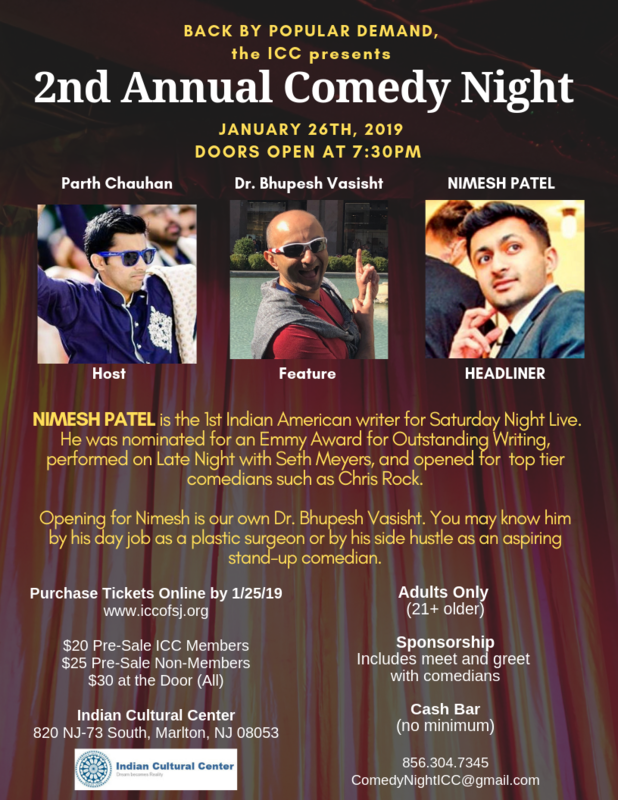 Back by popular demand, the ICC presents the second annual Comedy Night with NIMESH PATEL on January 26th, 2019. Nimesh is the 1st Indian American writer for Saturday Night Live. He was nominated for an Emmy Award for Outstanding Writing, performed on Late Night with Seth Meyers, and opened for top tier comedians such as Chris Rock. Opening for Nimesh, is our own Dr. Bhupesh Vasisht. You may know him by his day job as a plastic surgeon or by his side hustle as an aspiring stand-up comedian. Join us for what will be a great show hosted by Parth Chauhan.